When you choose pet boarding services from Safe Journey Dog Boarding in Portland, your dog has the run of the main floor of our Victorian era home including 12 hours a day of indoor and outdoor access. There are never any cages, crates, pens, or kennels. Your dog is free to roam, play, and socialize as they please. We have a small, high frequency clientele from the Portland metro area. As a result, the vast majority of dogs who stay with us on any given night treat us as their surrogate owners. The vast majority of time we manage a pack of calm, well-mannered family pets. If your dog is new here they will go through a brief adjustment period but it no time they will become part of our happy and relaxed dog family. For our two legged customers with handicaps or disabilities, or mobility issues, please let us know. We can meet you curbside so that you don't have to leave your car. - When you arrive, simply stay in your seat and leave your car running. We will come to the curb rain or shine to get your dog. Your dog will have up to 12 hours of indoor/outdoor access with our well adjusted socialized dog pack. High energy dog, no problem. Have a new puppy? No problem! If your dog is getting up there in years we have plenty of places for your pooch to rest and relax. Our dog pack is an excellent place for dogs with limited dog interaction experience to learn to be confident, calm, and social while around other dogs. We emphasize and re-enforce six main rules of canine good citizenship while your dog stays with us. These are no barking, chewing, fighting, jumping up on staff or visitors, bolting through open doors, and being housebroken. If your dog has challenges is these areas we have an outstanding well-mannered dog pack that will be consistently role modeling these good behaviors for your dogs benefit. You dog will receive regular supervision during the day while staying with us. So, inappropriate behavior can be addressed immediately and consistently. Valet Service For As Low As $10.00 Per Day - When you arrive at our Portland facility, simply stay in your seat and leave your car running. We will come to the curb rain or shine to get your dog. Your dog will have up to 12 hours of indoor/outdoor access with our well adjusted socialized dog pack. High energy dog, no problem, have a new puppy, no problem. If your dog is getting up there in years we have plenty of places for your pooch to rest and relax. Happen to have a job or profession where you work throughout the night. Nightcare is for medical professionals and others working graveyard and nighttime shifts. Nightcare allows you to drop-off and pick-up in reverse of traditional daycare hours without having to pay overnight boarding prices. The prices and services are the same as for doggie day care only you drop off before out closing time of 7pm and pick up right after we open at 7am. Just purchase a day care package and inform us of your work schedule. We are open 365 days per year to serve you! Skittish dogs act skittish because they are scared. A scared dog is in an unnatural state of anxiety that is difficult to maintain. It takes energy, adrenaline, and an accelerated heart rate, etc. for a dog to remain in flight, fight, or freeze mode. And, as long as the stimulus surrounding your dog remains calm, relaxed, happy, and carefree it is only a matter of time until your skittish dog allows his or her body to relax and calm down. We can never really know what kind of experience and past history a dog might have been exposed to. We do however know that it is only a matter time before a calm, relaxed, well mannered pack of dogs communicate through behavior, body language, and energy that Safe Journey is a safe and happy place for your dog to relax and wait for his or her owner to return. So, it is our job to create an environment where you skittish dog has nothing to fear. Then we give your dog plenty of space and time to blossom and come around. In the end, the vast majority of dog owners fears about dog boarding and dog daycare turn out to be unfounded. It is really not a question of IF your dog will comfortable staying with us, it is only a matter of how long will it take him or her to let go of unfounded fears and anxiety from past experiences so that he or she can relax and enjoy their stay here with us. Like skittish dogs, dogs with separation anxiety are fearful. In some cases they are fearful of being without you. In other cases, they are fearful of being left alone. The environment at Safe Journey has successfully overcome dozens if not hundreds of cases of separation anxiety. If your dog is simply afraid of being left alone at a daycare, no problem! Your dog will have an unlimited supply of friends, playmates, and human supervision. If you dog is afraid of being without you it will take more time but is an equally solvable problem. 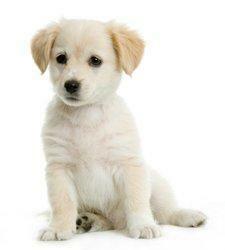 Your dog will simply have to go through an adjustment period where trust is built with us as a surrogate owners. It is only a matter of putting in sufficient time with us in our home until your dogs fear is replaced with trust. We maintain a calm, relaxed environment and surround your dog with happy well mannered four-legged role models. It is just simply impossible for your dog to stay in a state of panic, frenzy, or anxiety under these circumstances. It's like you going to a spa or a resort. When surrounded by a calm, relaxing, peaceful, happy environment it is only a matter of time until your day to day cares melt away. If you have a very young or high energy dog, the Safe Journey environment is a great place for you dog to let off steam. Your dog will have a never ending supply of playmates and playtime while staying with us. Our high energy dogs remain on their feet all day roaming, chasing, playing, and wrestling. Many Portland dog owners report to us that their dogs sleep long and sound after a stay with us and that their dogs behavior is noticeably improved over the next few days after returning home from Safe Journey Dog Boarding. Many of our regular dogs started with us as puppies and are still coming to see us today. Our dog pack provides great safe playmates who are used to being around lots of different types of dogs both young and old. Our well adjusted family pets role model Canine Good Citizenship for your dog to learn by example. You dog will learn to potty outside, minimize barking, not to chew or destroy furniture, not to fight, growl, or posture with other dogs, and not to jump up on people. We do not consider ourselves professional dog trainers and in fact it is our dog pack that provides most of the behavior modification for your dogs benefit. However, unlike when your dog is home alone, possibly chewing or barking, we are here all day with our dog pack. As much as possible, every growl, every bark, and every jump up onto a person gets addressed. And, you will see the difference between our regulars and any newbies who are on site when you come down to our property to take your initial tour. Safe Journey is a great place for your puppy to grow up, for your dog to socialize and learn to be comfortable around other dogs, or to simply brush up on good manners. Since 2006 we have taken care of every type, breed, and kind of dog imaginable. 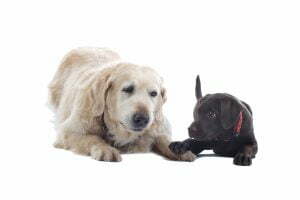 Is your dog blind, deaf, 19 years old, or diabetic? 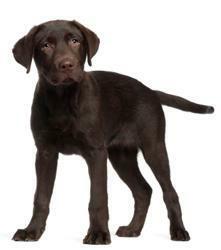 Is he or she fighting cancer, have only three legs, affected by arthritis, or Alzheimer's? We care for all kinds of dogs. Young, old, large or small. We give personalized individual service to all ages, breeds, types, or infirmities. 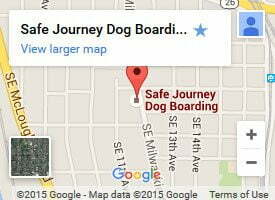 Come check us out and see if Safe Journey Dog Boarding makes sense for you and your dog! Since coming to Safe Journey, Bugg has really become socialized to other dogs--we almost can't believe it. She has been to many boarding and daycare facilities in her 13 years, but was never been interested in other dogs. Now when we take her to the dog park, she actually runs up to other dogs and hangs out with them! In the past she had little interest in other dogs and would either wander off by herself or stay near us. It seems your model of dog care works far better for her than anywhere else.